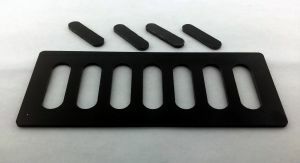 OSE black fiberglass battery tray. 1 tray per package. These trays are great for lifting your expensive lipo packs off the hull floor, to help stop them from water damage. They lift the battery 3.5mm off the hull floor. They fit packs up to 160mm x 55mm. Pictured with 2s 6500mah pack and velcro, not included. Requires ca to glue pads to the tray in the area you would like them.